We will jump directly into Management Role Scopes, continue with Management role groups and finish off with Management Role Assignment Policies. A regular scope determines where, in Active Directory, objects can be modified by users assigned to the management role. As a basic rule you can say that a management role determines what you can modify and a role scope determines where you can modify. This type of scopes behaves almost the same as a regular scope but with exclusive you can also deny user access to specific objects. Explicit scopes are set by you and enables you to control which objects a management role can modify. These can be one of the following. Organization – The role can create or modify recipient objects across the Exchange organization. Self – The role can modify only the properties of the current user’s mailbox. 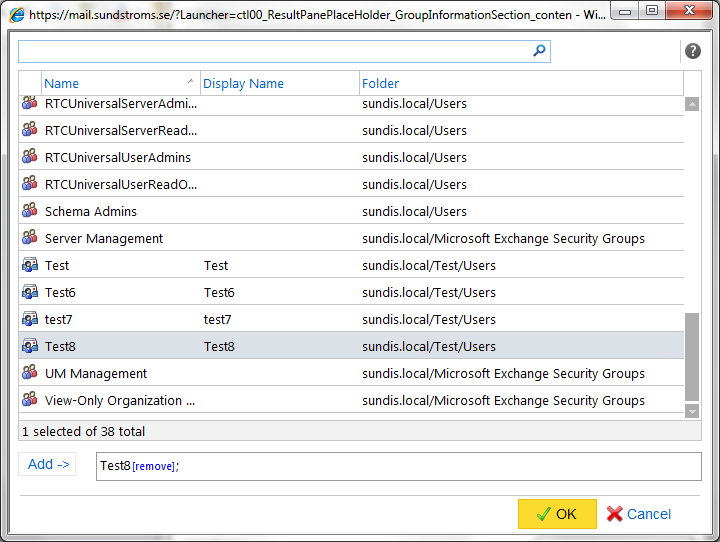 MyDistributionGroups – The role can create or modify distribution list objects owned by the current user. Role holder – A role holder is a mailbox that is a member of a role group. All assignments of management roles applied to a role group will affect the member mailbox, Role Holder, when the mailbox is added to a group. Management role group – Eniversal security groups (USG) used when assigning permissions for multiple mailboxes. Management role assignment – Assignments is the link between management roles and management groups. When you assign a role to a group, all members in that group will be granted the included permissions. Role assignments can be both scoped and un-scoped. Management role scope – The impact on a role assignment when you assign a role with a scope to a role group. Can consist of recipients, OU’s or servers. Management role – Management Role entries grouped together forms a Management Role. Roles define the tasks that can be performed by the members of a role group. 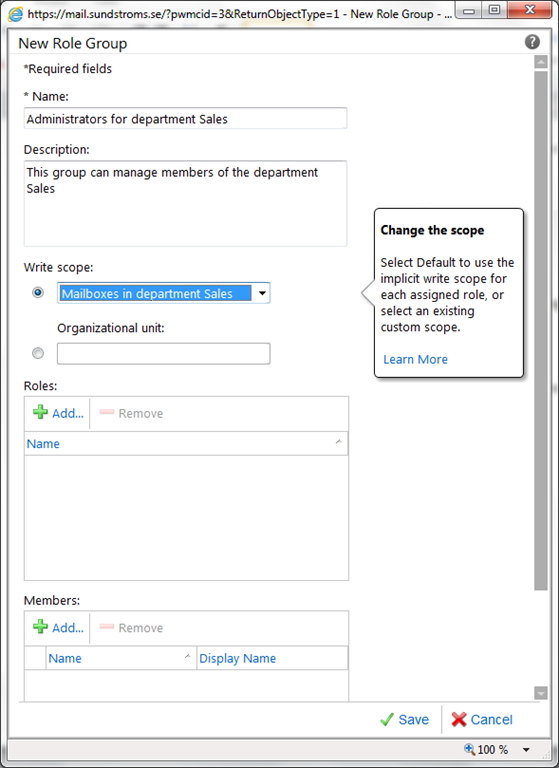 Management role entries – Individual entries that can provide access to cmdlets, scripts, and special permissions. Can be a single cmdlet and its parameters. Management Roles Assignment policies consist of one or more user management roles. This is used to control the end-users permissions to manage their personal Exchange Server 2010 mailbox and distribution group configuration. There are two types of policies in Exchange Server 2010, Default and Explicit. 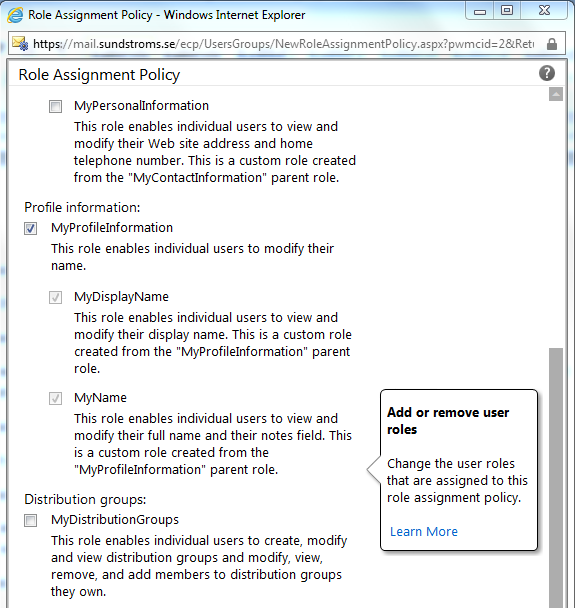 If a role assignment policy is not assigned to a new mailbox the default role assignment policy kicks in and provides users with a set of basic and common permissions. 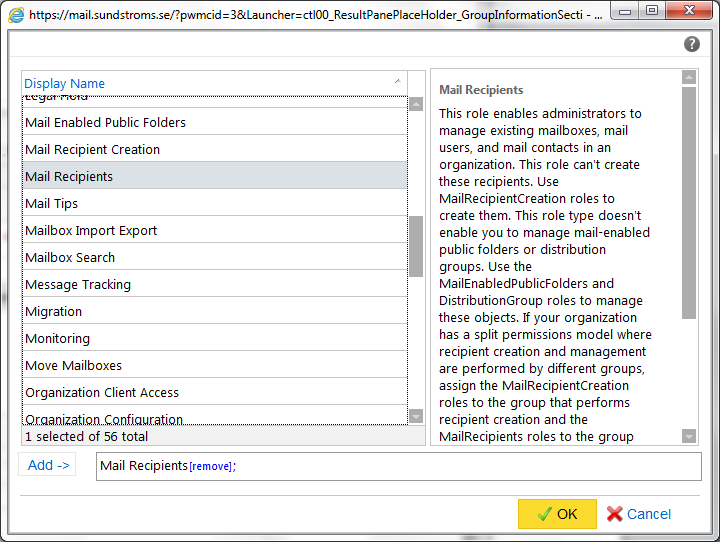 A role assignment policy can be applied to a user’s mailbox with either the New-Mailbox or Enable-Mailbox command. You can also define your own role assignment policy as a default policy. This is done using the Set-RoleAssignmentPolicy command. 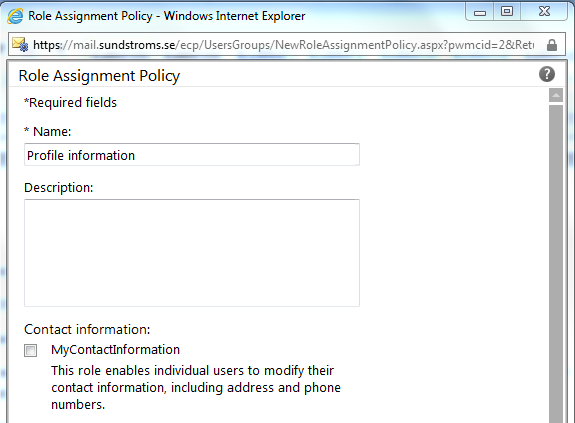 Doing so will apply the new default role assignment policy to all new mailboxes, not the current one already created. You can also change the default role assignment policy, this is not something I recommend since it is good to have for reference and as a backup if you need to remove your own policy. 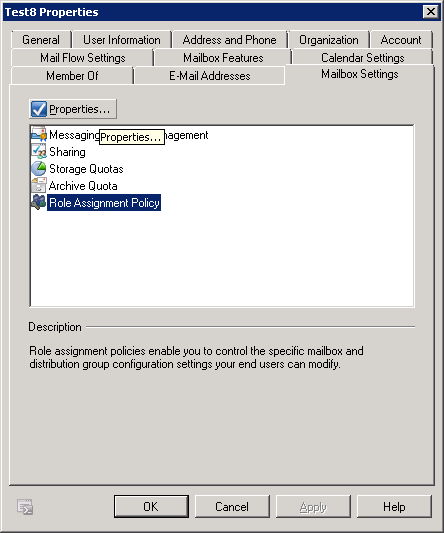 To apply a new policy to a mailbox you must use the Set-Mailbox cmdlet, this updates the mailbox with the new setting. When you assign a role assignment policy manually using the RoleAssignmentPolicy parameter on the New-Mailbox, Set-Mailbox, or Enable-Mailbox cmdlets this policy is called an explicit role assignment policy. In part 3 of this series I will give you examples, examples and more examples. I’m doing my best to get it done as soon as possible and it will be ready in a couple of weeks. Thanks for reading, and as always just let me know if you have any thoughts or questions! This is part one in my series of posts about Role Based Access Control. If you find an error of any sort, have any questions or thoughts about it please do not hesitate to drop a comment or contact me. There are two primary ways of assigning permissions to users, management role groups and management role assignment policies. We will start by looking at Management Roles, Management Role Entries and Management Role Types, they are fundamental to groups and policies. Management roles is a way to logically group a number of cmdlets which makes it easier to identify the specific roles an administrator or user should have access to. 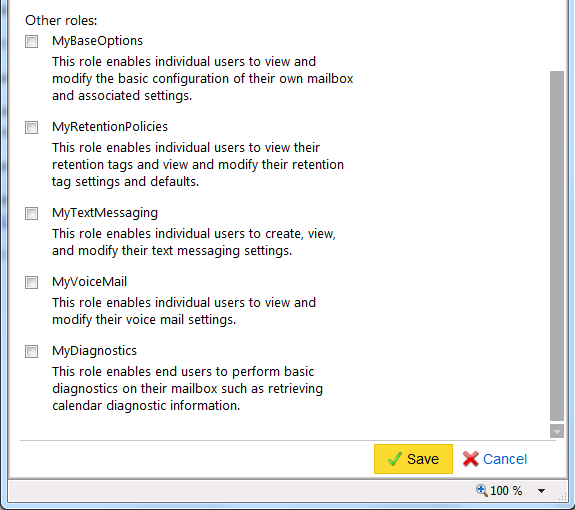 One role can provide access to view or modify the configuration of Exchange 2010 components. For example mailboxes, transport rules, ActiveSync policies and recipients. These roles can be grouped together in to management role groups and management role assignment policies. We will look more at these two further on. Management roles can be assigned to role groups, role assignment policies and directly to users. The latter is not recommended though, assigning roles directly to users will most likely make you environment unnecessarily complex to administrate. 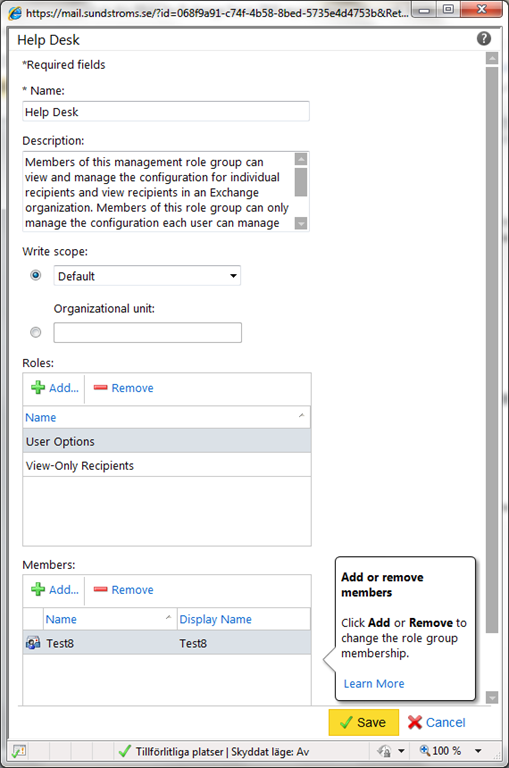 NOTE: End-user management roles can only be added to role assignment policies, not management role groups. There is a large number of pre-made built-in management roles that will be enough for most scenarios and covers a lot of different areas of Exchange Server 2010. These roles can’t be changed or altered in anyway. You can however create your own management roles and include the built-in ones. A new management role can be changed but that is an advance procedure and not recommended. I will not cover that topic in this post but might add it later. Administrative or specialist – Has a broad impact in the Exchange organization, Roles of this role type enable tasks such as server or recipient management, organization configuration, compliance administration, and auditing. User-focused – User specific scope, enables user oriented tasks such as user profile configuration, self-management and management of user-owned distribution groups. This type enables tasks such as application impersonation and the use of non-Exchange cmdlets or scripts. Databases – This role type is associated with roles that enable administrators to create, manage, mount, and dismount mailbox and public folder databases on individual servers. This type affects specific servers. 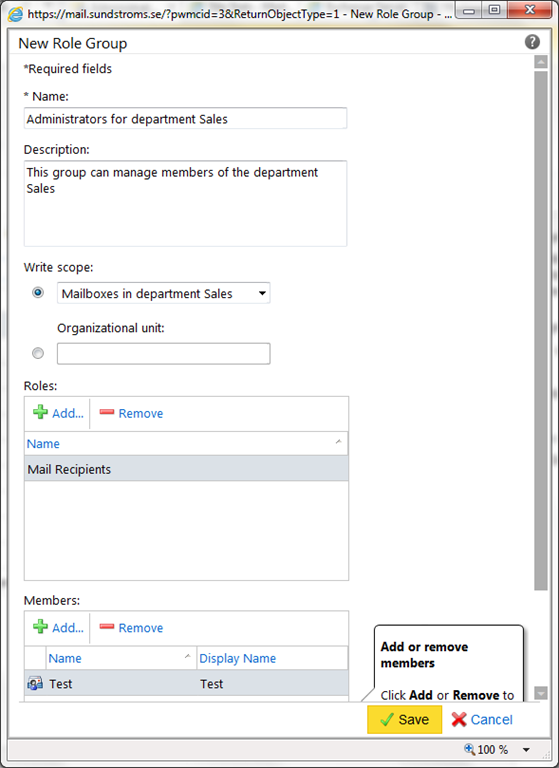 MailTips – Associated with roles that enable administrators to manage mailtips, affects the entire Exchange organization. With the use of Unscoped Top Level Management Roles you can control access to custom scripts and non-Exchange cmdlets for users. Since these rules have no parents that defines its content it is called Top Level and considered equal to built-in management roles. 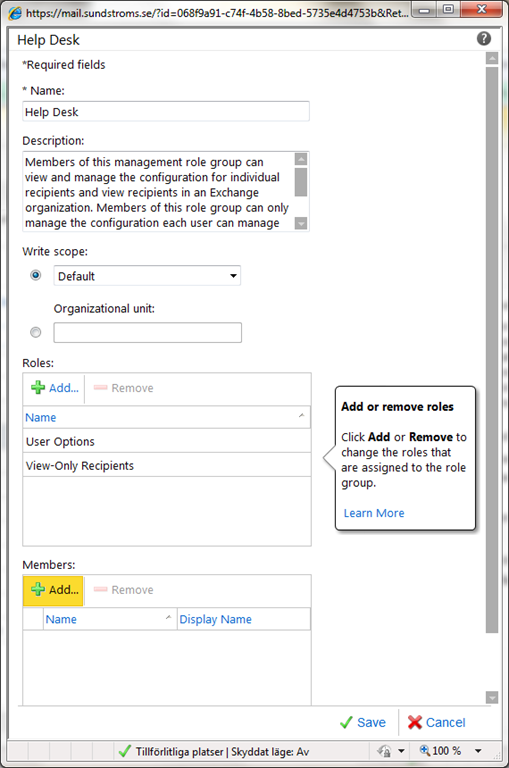 Unscoped roles always enable the user to do organization wide configurations. Granting a user this access will give him or her access to any object in the Exchange Server 2010 organization. These roles should be used with caution but they can be very useful. For example, you can create a script and include it in a role. When you assign that role to a user, he or she will be able to perform only the specific functions provided by the script. Entries are the basic part of a Management Role. It is included in every role, without entries there would be no roles. An entry can be a cmdlet, permission or a script that you want to include in a role. Entries can be added or removed depending on what type of role you are editing. To add a script you need to use the previously mentioned Custom Management Role. When the built-in management roles aren’t enough you can create and configure custom management roles. These are based on built-in management roles and inherit all parent entries. You can change a custom management role to match your specific needs by removing inherited entries. Note that you can only use inherited entries. You cannot add other specific entries to a custom management role. I would not recommend the use of custom management roles unless it is absolutely necessary, they are quite complex. Built-in management roles will be enough for most scenarios. When used with a Custom Management Role, an entry is called Unscoped Top Level Role Entry. There are a couple of things to consider when creating these entries. All parameters for the entries needs to be specified, Exchange will try to verify these. Only specified Parameters will be available to the users. Remember to update the role manually if you change any of the entries. Exchange does not update the role. All scripts must be placed in the Exchange 2010 scripts directory (Default: C:\Program Files\Microsoft\Exchange Server\V14\Scripts). Remember to install all Non-Exchange cmdlets on all servers. 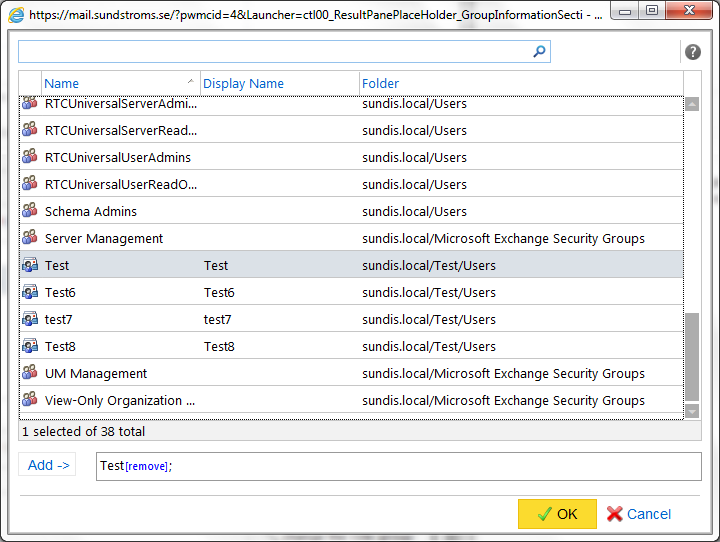 Also remember to add the Windows PowerShell snap-in name for the cmdlet. Unscoped Top Level Management Roles – Controls access to custom scripts, permissions and non-exchange cmdlets, always organization wide. Custom Management Roles – Based on Built-in Management Roles, inherited entries can be removed. Management Role Entries – Included in every role, can be a cmdlet, permission or a script. Unscoped Top Level Role Entry – Define all parameters, manual role update after changes. Management Role Types – Defines the affecting scope for management roles, three descriptive categories. In my next post I will continue with Scopes, Management Role Groups and Management Role assignment Policies, thanks for reading!